AssurPharma is a collaboration project between Belgian pharmacists and insurers. Do you have your medication costs reimbursed through hospitalisation insurance or outpatient care insurance? If so, you can have your BVAC certificates sent from the pharmacy to Vanbreda Risk & Benefits automatically and in digital format. Thanks to AssurPharma, you will no longer need to send the paper BVAC certificates* to Vanbreda by post or by e-mail. After registering using this link, you will receive a personal barcode from Vanbreda. 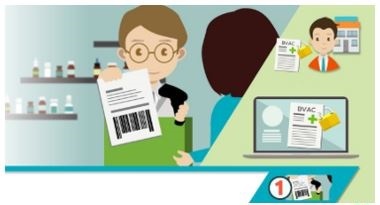 The pharmacist scans this barcode and Vanbreda does the rest, offering you more convenience and helping to reduce the paper flow. *What is a BVAC certificate? Hospitalisation insurance often covers pharmaceutical costs before and after admission to hospital. Outpatient care insurance often also covers pharmaceutical costs, too. In order to process reimbursements, the insurer requires certain information that can be found on the BVAC certificate. The pharmacist gives this BVAC certificate to the patient, who in turn passes it onto their insurer. This allows the costs to be processed correctly. BVAC stands for “bijkomende verzekering/assurance complémentaire” (additional insurance). You can request barcodes per patient or insured using this form.